Exciting news at the end of 2018, it was reported that women motorcyclist ridership now makes up 19% of ownership. This new stat is from the MIC 2018 Motorcycle/ATV Owner Survey. Nearly one in five motorcycle owners is now female according to the report. Riding with her furry babies! From a business standpoint we have seen an increase in woman ridership. As the manufacturers recognize this trend you will see designs and marketing to this increasing group of riders. 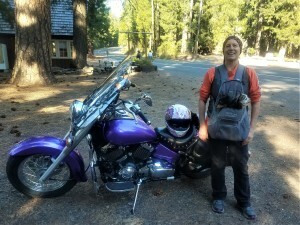 The power of having control over your own motorcycle is a key factor for women motorcyclists. Many women have stated that they don’t want to just be a passenger. There is no substitute for having the wind in your face, full view of the scenery and full control of the bike. One recommendation if you have been a passenger and want to transfer to the driver seat is to start with a good motorcycle training class. This is so valuable and in some states a requirement before you can obtain your motorcycle endorsement. Once this has been done the next thing to do is to practice, practice and more practice. Another suggestion is to join a local club that will fit your style. Check with your local motorcycle shop for suggestions as well. As we are awaiting the blooms of spring, now would be a good time to explore your options for becoming a woman motorcyclist! Ride on!